Dana Farber Athlete Sarah Nixon winning the inaugural B.A.A. Half in 2001. Photo courtesy of the B.A.A. Registration opens on Wednesday, July 18 at 10:00 a.m. ET, and will continue until we reach our maximum field size limit. We will be accepting just over 5,000 entries on a first-come, first-served basis. 3,050 athletes are pre-registered through the B.A.A. Distance Medley. 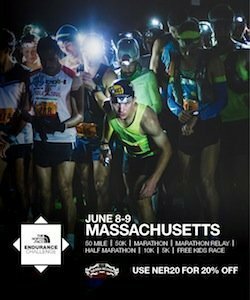 The remaining balance of 9,000 entrants will consist of Dana-Farber athletes, VIPs, and elite athletes. The B.A.A. Half Marathon will be held on Sunday, October 7, and will be the third and final race in the 2018 B.A.A. Distance Medley. The entry fee is $85.00 USD. Participants in the B.A.A. Half Marathon must be at least 14-years old on race day. Entry in the B.A.A. Half Marathon cannot be transferred, refunded, or deferred. There is no qualifying standard required for this event. Add meaning to your miles on Dana-Farber’s B.A.A. Half Marathon team. Dana-Farber and the Jimmy Fund is the presenting sponsor and exclusive charity team of the B.A.A. Half Marathon. Team members commit to raising crucial funds for cancer care and research and receive great perks, including a personal fundraising webpage, training program designed by 1976 Boston Marathon® winner Jack Fultz, and a Dana-Farber singlet! Register today and help us race toward the ultimate finish line: a world without cancer.